Epcot, Walt Disney World Resort Florida. To the right you can see a Photo from an area within Epcot called The Land. I took the photo during a recent holiday to Florida. 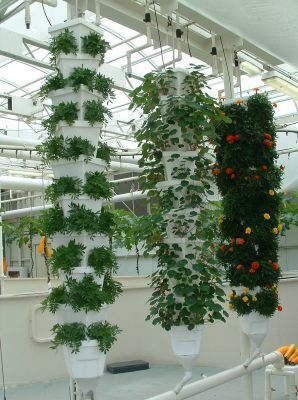 The photo shows the large scale aeroponic system they are using within the large greenhouses they have there, The plants are fastened from above to a track system which moves the plants continously through the aeroponic system. You can see on the photo one of the plants start to emerge from the aeroponic spraying system. Note the huge roots dangling from te system. The size of the roots is the first thing you notice from a system like this, Even in the aeroponic propagator which I am trying I’m amazed at the size of the roots which the system allows to grow and the speed at which they grow. To the left is another photo from a recent visit to Epcot, This time it’s of their huge Water Culture system. Massive compared with my own system but it works on the same principle. 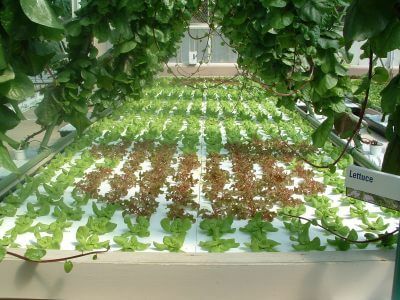 The lettuce is placed on floating boards so the roots dangle into the nutrients below. 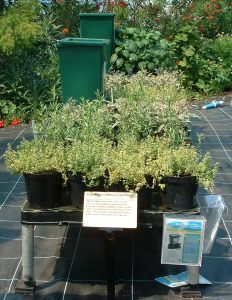 The nutrients are then aerated by bubbler systems to oxygenate the nutrients and keep the plants healthy. This final picture from Epcot shows a system which I found intriguing, The system is made to optimize the growing area available. 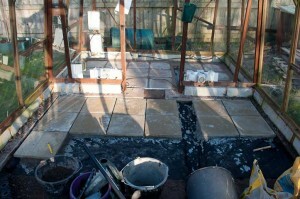 It looks great and would be an ideal system to have on a deck or patio area, I may even try the system myself one day. 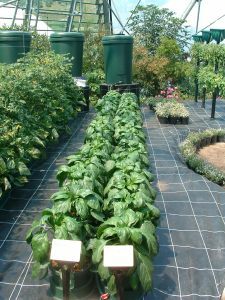 The plants are placed into standard styrofoam type containers which work like hanging baskets, The nutrients are pumped to the top basked where it flows down through the other containers into the drain at the bottom, It’s then pumped back up to the top and the cycle starts again. Presumably the baskets are filled with a neutral growing medium such as perlite but I didn’t see inside any of the containers so I can’t confirm this. Below is a panoramic photo I took during our recent visit to the Eden Project in Cornwall, England. The photo was created with 9 individual digital camera photos, which were joined together automatically with a program called AutoStitch. I think you’ll agree the effect is very effective. 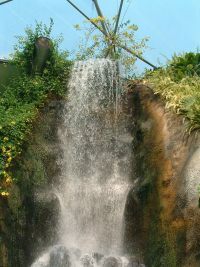 Eden project was built to try and teach people about how much we depend upon plants. Whether it’s for food / clothes / shelter or medicine. 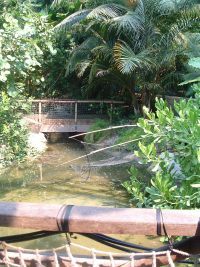 Eden project was built in a disused slate quarry, revitalising the surrounding area and becoming one of the UK’s most popular tourism attractions. The part of the Eden Project which most people go to see and experience are the huge biomes, you can see these dominating the photo above. 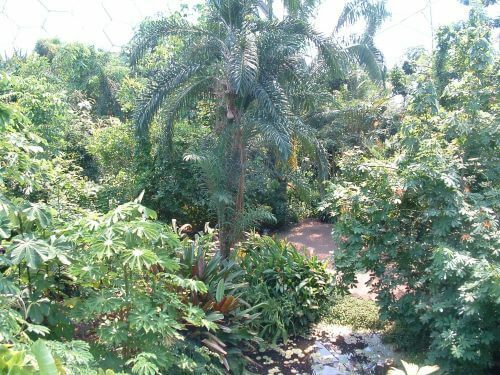 One of the biomes is temperature and humidity controlled to be a copy of a warm temperate climate, and the other biome is controlled to be a humid tropics climate, If you go into the humid biome make sure you have some water with you as it’s very hot and humid as you would expect and it’s quite a trek to see it all. It’s tricky to try and give you some of the effect of being inside the biomes but below you can see a few small photo’s taken while we were in the biomes. The previous time we had visited the Eden Project there were no signs of Hydroponics being in use, But this time they appear to have gone overboard on it. systems they are demonstrating in the warm temperate biome. The systems are all simple passive systems which are fed from large green nutrient containers which you can see in the photos. 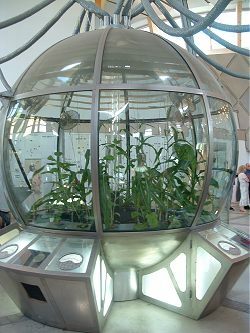 I’m sure quite a few people are seeing hydroponic growing for the first time when they visit the Eden Project. As well as these simple systems, inside the new educational building called the Core is a very large self contained example of hydroponic growing. 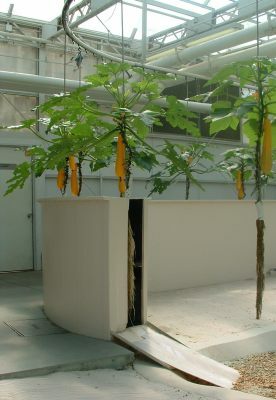 The system itself contains lots of plants which appear to be sweetcorn and are growing in clay pebbles within large pots. 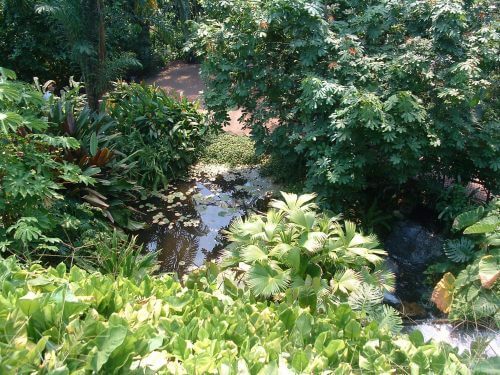 The system itself is an example of a flood and drain system, which you can see described on my ‘Methods’ page. The system contains several large HID (high intensity discharge) lamps to provide the light needs for the plants, several fans to allow the air to recirculate and also large nutrient reservoirs. I’m also pretty sure a CO2 system is in place to supplement the natural CO2 available to the plants. If you enjoy plants like I do the Eden Project is definately worth a visit.